The emotional, clinical, and even legal ramifications of an adult’s recollection of childhood trauma have forced memory research into the public limelight. Indeed, decisions related to public policy, ethical practices of clinicians, and child-parent lawsuits have depended in part on what science can tell us about the notion of reinstated memories. 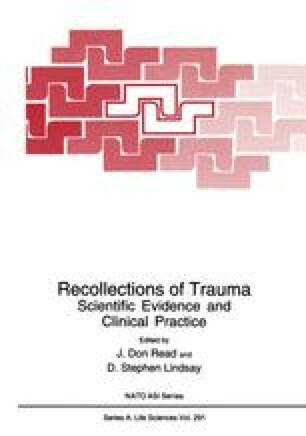 I use the term reinstated memories to refer to instances in which an individual recollects a traumatic experience that previously was not available to conscious or explicit report. The term is meant to be neutral with respect to the veracity of the recollection, especially compared to other terms such as recovered,repressed, or false memories, which by their terminology can appear to be biased toward either the complete validity or complete falsity of a recollection.